Based on previous National Bridge Inventory data, the state of Iowa has nearly 20,000 bridges on low-volume roads (LVRs). Thus, these bridges are the responsibility of the county engineers. Of the bridges on the county roads, 24 percent are structurally deficient and 5 percent are functionally obsolete. A large number of the older bridges on the LVRs are built on timber piling with timber back walls. 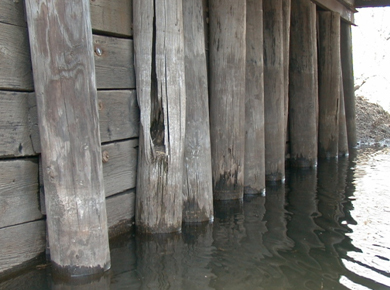 In many cases, as timber abutments and piers age, the piling and back wall planks deteriorate at a rate faster than the bridge superstructure. As a result, a large percentage of the structurally deficient bridges on LVRs are classified as such because of the condition of the timber substructure elements. As funds for replacing bridges decline and construction costs increase, effective rehabilitation and strengthening techniques for extending the life of the timber substructures in bridges with structurally sound superstructures has become even more important. Several counties have implemented various techniques to strengthen/repair damaged piling, however, there is minimal data documenting the effectiveness of these techniques. There are numerous instances where cracked and failed pilings have been repaired. However, there are no experimental data on the effectiveness of the repairs or on the percentage of load transferred from the superstructure to the sound pile below. To address the research needs, a review and evaluation of current maintenance and rehabilitation methods was completed. Additionally, a nationwide survey was conducted to learn the methods used beyond Iowa. Field investigation and live-load testing of bridges with certain Iowa methods was completed. Lastly, laboratory testing of new strengthening and rehabilitation methods was performed.